The New Jersey resident who took the video, Zdenek Gazda, told Foxnews.com he had been a fireman in the Czech Republic and came to the 9/11 ceremony to pay his respects. After Clinton left the ceremony, the reporters following her on the campaign trail were prevented from leaving the media area for a period of time. “It’s a beautiful day in New York,” Clinton yelled to press waiting across the street. She bent down to take a photo with a young girl and said “thanks everybody” to a nearby crowd cheering her. Asked again about her health, Clinton said she was “great, feeling great” and then got into her van. A spokesperson said she was headed to her house in Chappaqua, where former President Bill Clinton, who did not attend the 9/11 ceremony, was waiting. 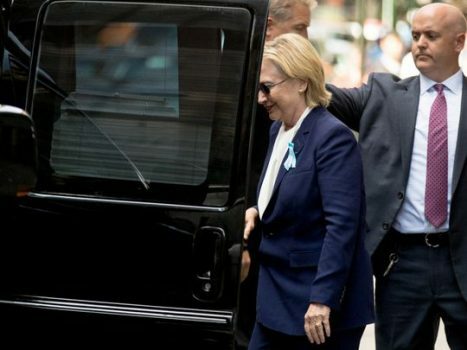 She was examined by her doctor after arriving in Chappaqua.